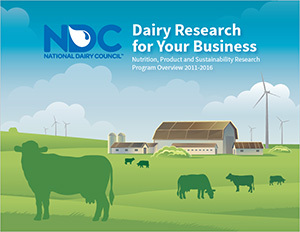 Looking for more portable resources and insights on U.S. dairy? 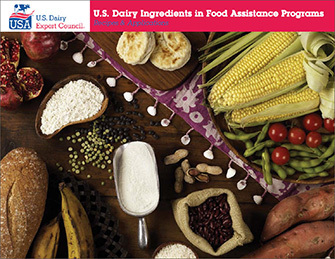 This library of materials provides global customers with downloadable and printable publications to further their knowledge and understanding of U.S. dairy products, their nutritional advantage and technical application as well as tools to promote U.S. Dairy to global consumers. Be sure to check out our foreign language sites for resources in Spanish, Arabic, Chinese, Portuguese, Korean and Vietnamese (Japanese coming soon). All publications and tools are provided in a PDF format. Adobe Acrobat Reader will need to be installed in order to view these documents. 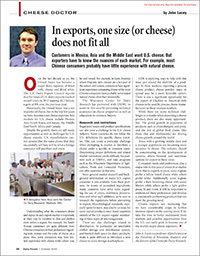 Cuisine & Wine Asia culinary supplement featuring U.S. cheeses with creative twists on traditional varieties and how their impressive flavors have been uniquely woven into Southeast Asian dishes. 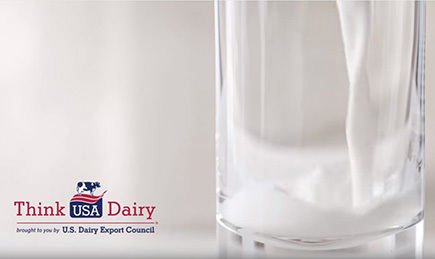 A detailed manual designed to guide and educate international buyers and users about U.S. milk powders and microfiltered ingredients. 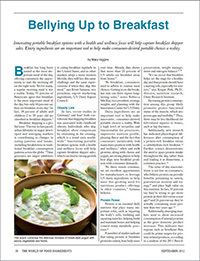 Cuisine & Wine Asia culinary supplement featuring six chefs' innovative integration of U.S. cheeses into Southeast Asian recipes, drawing on U.S. cheeses' variety and quality to complement diverse local cuisine. Cuisine&Wine Asia culinary supplement featuring five regional chefs delightfully incorporating U.S. cheeses into recipes tailored for the vibrant gastronomic scene in Singapore. 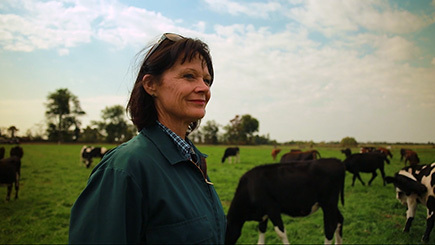 U.S. dairy proteins are minimally processed from our sustainably-produced milk supply. 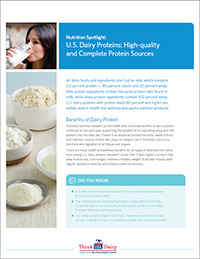 Advantages dairy proteins offer include delivering unmatched nutrition, functionality and versatility compared to alternative protein sources. 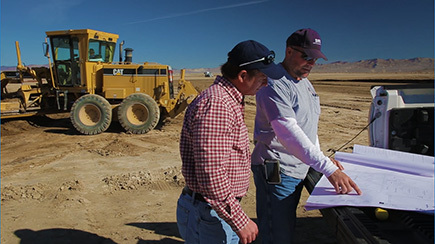 Download this technical report to learn more. 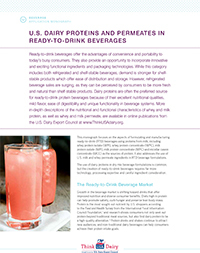 A monograph highlighting the use of U.S. dairy ingredients in ready-to-drink beverages. 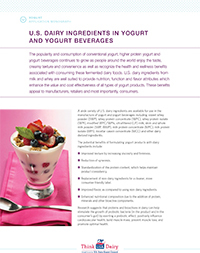 This 20-page monograph outlines U.S. dairy ingredients in yogurt and yogurt beverages. This infographic shows a sample of how much you would have to eat to get 25 grams of protein from different sources. 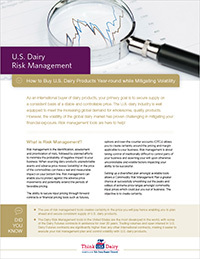 This 4-page brochure provides an overview of tools available to international buyers to manage their financial exposure when buying U.S. dairy products. 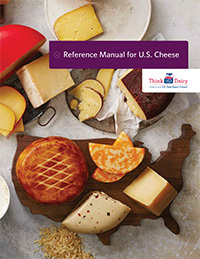 A detailed handbook designed to guide and educate international buyers and end-users on purchasing and using U.S. cheeses. This brochure provides an overview of the EU's continued overreach with geographical indicators (GI) throughout the world. 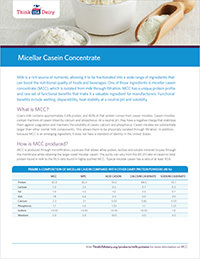 This 2-page document highlights the composition, functionality and nutrition of micellar casein concentrate. 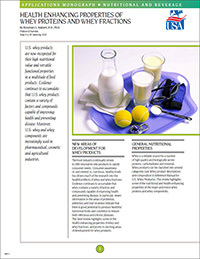 This 4-page brochure provides an overview of whey & milk permeate made in the United States. Available in Arabic, Korean and Vietnamese. 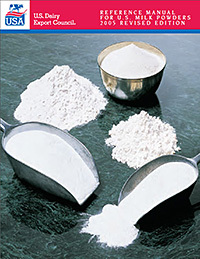 This 4-page brochure provides an overview of the U.S. milk powder industry and how it is evolving to meet global customer demand. Available in Arabic and Chinese. 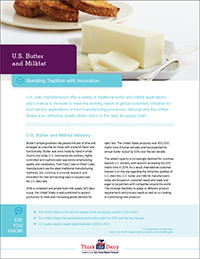 This 4-page brochure provides an overview of the U.S. butter & milkfat industry. Available in Arabic and Chinese. 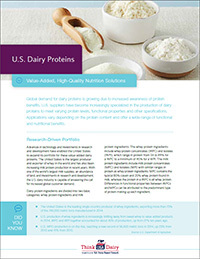 This 4-page brochure provides an overview of whey and milk protein ingredients made in the United States. Available in Arabic, Chinese and Japanese. 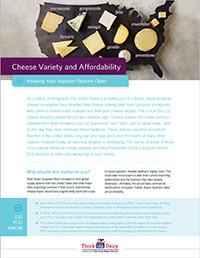 This 4-page brochure provides an at-a-glance overview of the U.S. cheese industry. Available in Arabic, Chinese, Korean and Vietnamese. 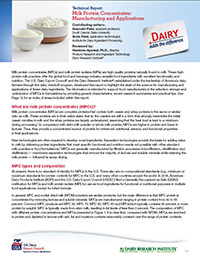 Milk protein concentrates (MPCs) are complete dairy proteins containing both caseins and whey. 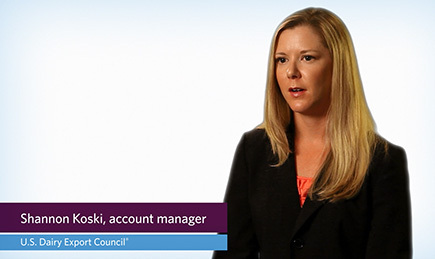 This 4-page document provides an overview of MPCs, their benefits and their applications. An introduction to U.S. 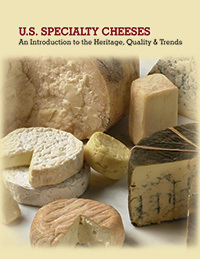 Specialty Cheeses made in the United States, the industry’s heritage as well as product quality and trends. Available in English. 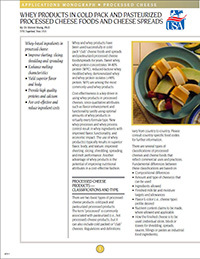 This 49-page guide details the versatility of Hispanic and Latin American cheeses, which come in a variety of flavors and textures suitable for many uses. 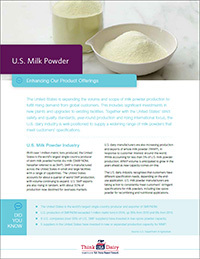 A detailed handbook designed to guide and educate international buyers and users about U.S. milk powders. Available in English. 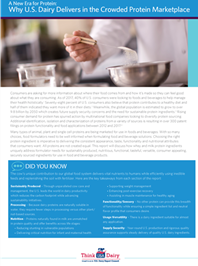 This 2-page document showcases the various varieties of cream available to food and beverage manufactures and foodservice professionals. 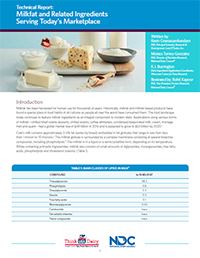 This 2-page document details the numerous benefits and varieties of nonfat dry milk. 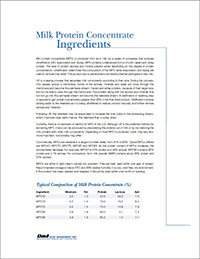 This 2-page document showcases the composition and beneficial features of milk protein concentrate. 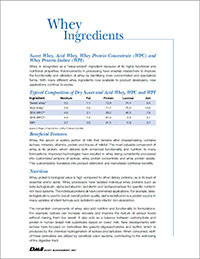 This 2-page document details the composition, functionality and nutrition of whey ingredients. 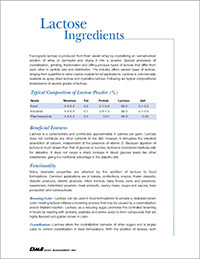 This 2-page document explains the beneficial features of lactose. 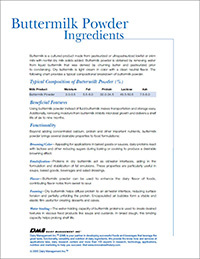 This single-page document details the benefits of using buttermilk powder. 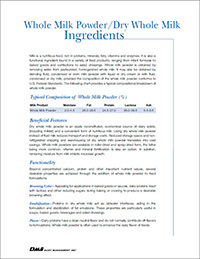 This 2-page document details the beneficial features of using whole milk powder and dry whole milk. 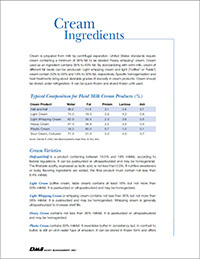 This 2-page document details the composition, functionality and nutrition of ultrafiltered milk. 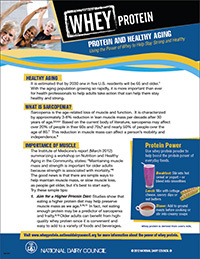 An educational guide to using U.S. whey and lactose products. Available in English and Korean. 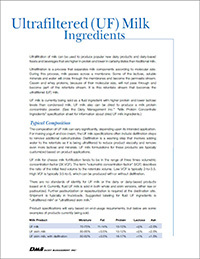 This 8-page technical report provides information about expanded utilization of whey proteins. 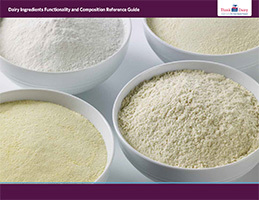 The Dairy Ingredients Functionality and Composition Reference Guide features compositional analysis for U.S. milk and whey ingredients as well as functional information for theseingredients when used in food applications. 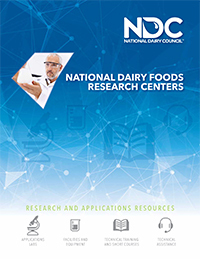 This resource offers a detailed overview of the National Dairy Foods Research Centers and Applications Labs, which provide the industry with leading-edge dairy product and ingredient research and technical resources to support industry innovation. 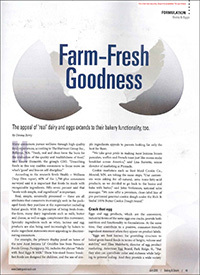 Technical report that explores the nutritional aspects of milkfat. 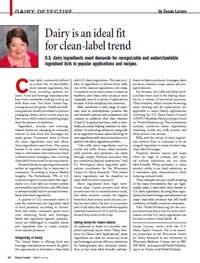 Dairy ingredients can meet the clean label demands challenging food and beverage manufacturers to simplify their product ingredient lists. 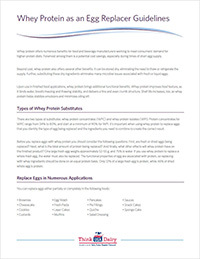 These guidelines provide details on how to effectively leverage the functionality of whey proteins as an egg substitute in formulations. 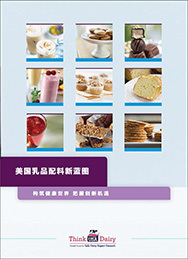 16-page brochure in Chinese highlighting the U.S. dairy industry’s evolving dairy ingredient portfolio such as whey protein, milk protein and permeate. 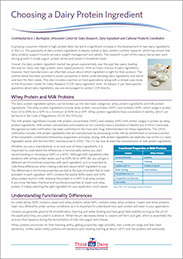 With dairy protein ingredients gaining in popularity for their functional and nutritional properties, get tips on when to formulate using whey protein compared to milk protein ingredients. 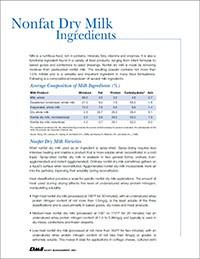 This 12-page technical report explains how the utilization of high-protein dairy fractions provides high-value ingredients to the food industry. 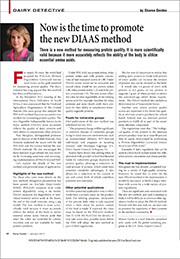 New discoveries continue to be made in beneficial uses for the coproducts of these processes. The U.S. 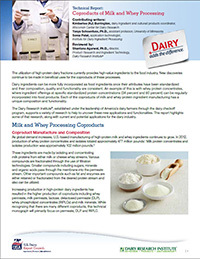 Dairy Export Council® and the Dairy Research Institute® developed this 12-page technical report to highlight the state of the science for manufacturing and applications of these dairy ingredients. Available in English, Chinese, and Korean. 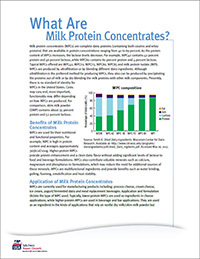 This 8-page technical report summarizes the emerging fractionation research on advances in the wide variety of rich nutrients found within cow’s milk, as well as the latest research on dairy ingredient processing and applications. 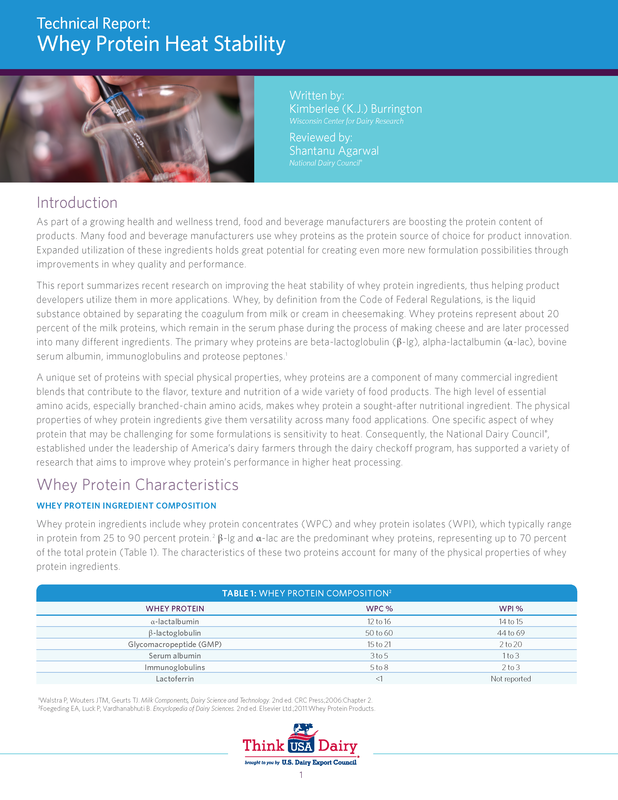 An 8-page report summarizing research on improving sensory properties of whey protein ingredients. 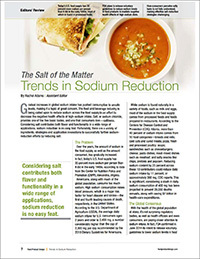 This 4-page monograph details how current science indicates that permeate’s salt-enhancing characteristics make it ideal for replacing salt in many applications while maintaining consumer-acceptable flavor. 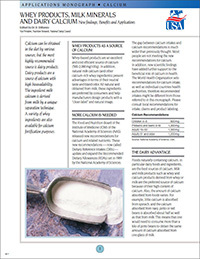 A monograph designed to educate users of whey products about the benefits of whey in baked goods. Available in English, Chinese, Japanese and Vietnamese. 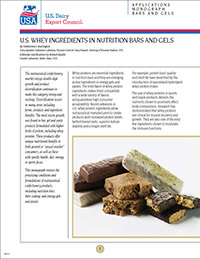 A monograph presenting whey protein functions in nutrition bars and gel-type products. Available in English, Chinese and Korean. 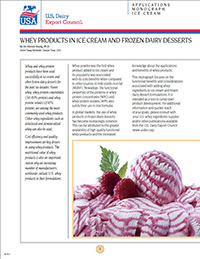 A monograph highlighting the functional benefits of whey in ice cream and related products. Available in English, Chinese, Japanese and Korean. 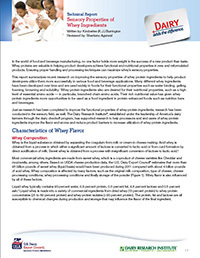 A monograph discussing the functional benefits of whey in processed meats and related products. Available in English, Arabic, Chinese, Japanese and Korean. 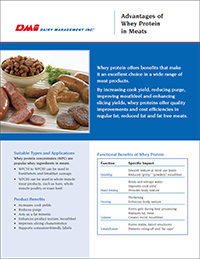 Benefits of whey protein ingredients in meat product applications. 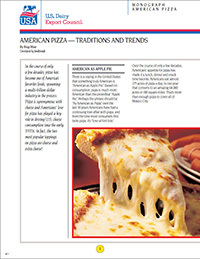 A monograph reviewing the history and trends in U.S. pizzas. Available in English, Arabic, Chinese, Japanese, Korean, and Spanish. 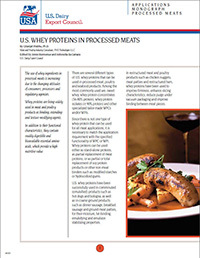 A monograph providing complete information on U.S. whey proteins usage in low-fat foods. Available in English and Chinese. 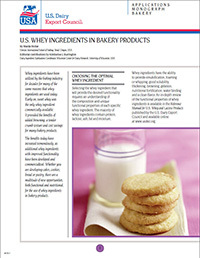 A monograph discussing the use of U.S. whey ingredients in snack manufacture. Available in English, Chinese and Spanish. 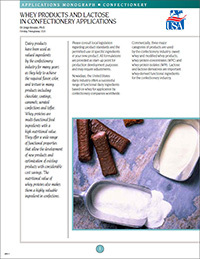 A monograph providing detailed information about the use of dairy ingredients in chocolate confectionery. Available in English, Chinese, Korean. 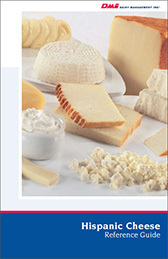 A monograph discussing the rationale for using whey in processed cheeses and related products. Available in English, Chinese and Korean. Cuisine & Wine Asia recipe supplement featuring Southeast Asian chefs' innovative creations with U.S. cheeses, demonstrating the quality and versatility that make them perfect companions for a range of creative dishes. The perfect tool to educate consumers on how to pair U.S. cheese with beer. 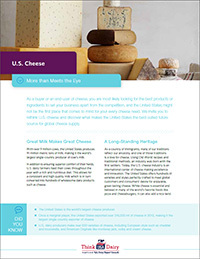 The perfect tool to educate consumers on how to pair U.S. cheese with wine. 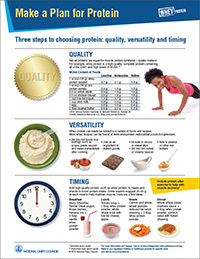 A one-page document detailing the three steps to choosing protein: quality, versatility and timing. 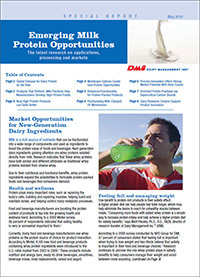 View trends and opportunities for dairy to deliver on higher protein diet benefits. 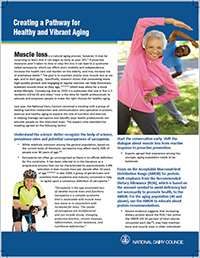 Learn about how consuming more high-quality protein and engaging in regular exercise can help adults maintain muscle mass as they age. 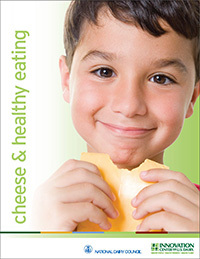 This brochure provides statistics, facts and nutrition information on cheese and how it can help meet health and wellness needs. 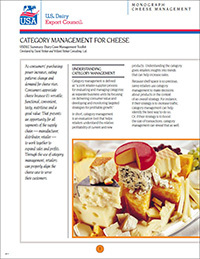 A monograph designed to educate retailers on cheese case management. Available in English, Japanese, Korean, Portuguese, and Spanish. 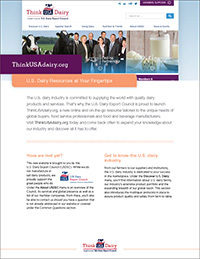 This 4-page brochure provides an overview of the U.S. dairy industry. Available in Arabic, Chinese, Japanese and Vietnamese. 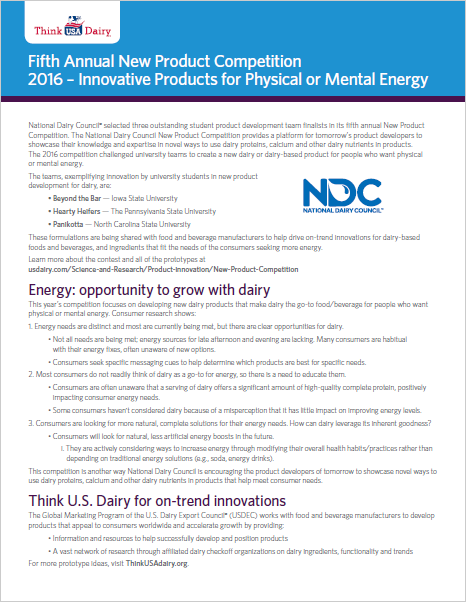 This 2-page brochure provides an overview of USDEC's new website offering dairy resources for Global Product Innovation. 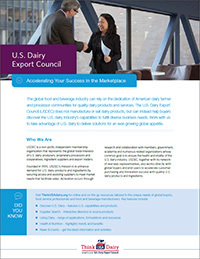 USDEC offers U.S. dairy resources for the global food and beverage industry to accelerate their success in the marketplace. 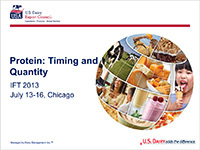 View trends and opportunities for dairy in higher protein diets and healthy aging. 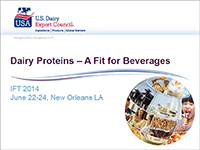 View trends and opportunities for dairy in beverages. Presents the benefits of consuming whey protein, in combination with resistance training exercise, as a safe and effective strategy for building and maintaining muscle mass and for preserving one's health throughout the aging process. Available in English and Korean. 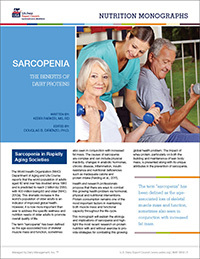 A monograph describing the benefits of dairy proteins, specifically whey protein, in the prevention and treatment of sarcopenia. Available in English, Japanese and Korean. 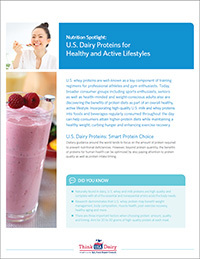 This 2-page document explains how interest in protein, spurred by a growing body of science, dietitian/trainer advice and a more educated consumer, continues to increase. 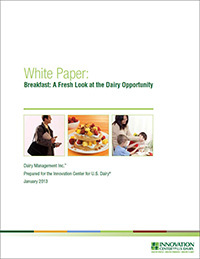 White paper detailing opportunities to incorporate U.S. dairy innovation in the breakfast occasion. 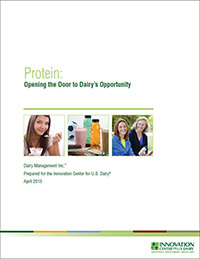 This white paper examines consumer attitudes, behaviors and trends around protein intake, how proteins are perceived and consumed, and what protein-based innovation opportunities exist. 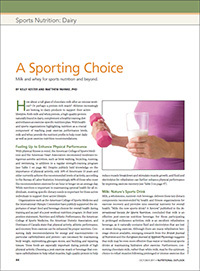 Athletes increasingly are looking to dairy products to support their active lifestyles. 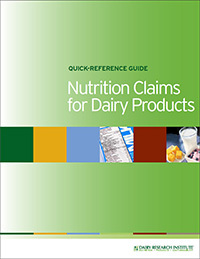 This guide provides a basic understanding of nutrition claims and labeling rules, specifically nutrition and health-related claims that represent opportunities for use with fluid milk, cheese and yogurt products. 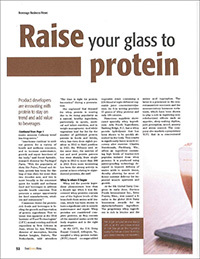 A report highlighting the role of whey protein at breakfast. Available in English, Japanese, and Korean. 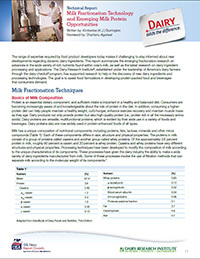 A report highlighting the latest research on applications, processing and markets for milk proteins. Available in English. 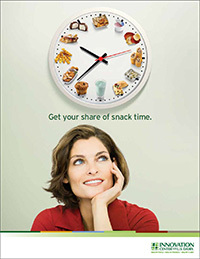 View this detailed white paper on consumer trends and the future of dairy and snacking. 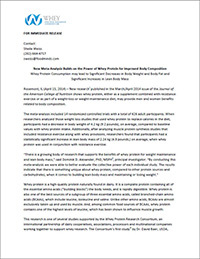 This 2-page report explains how sales growth potential exists if women are given a compelling reason to increase consumption of high-quality whey protein, such as body toning and long-term health benefits. 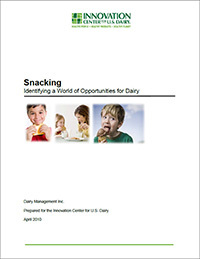 This 8-page brochures examines how incorporating dairy and dairy ingredients into new snack products can help tap into this lucrative market and increase sales with products that consumers crave. 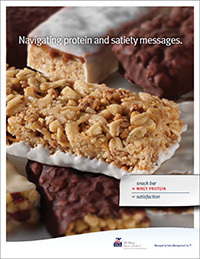 This 6-page brochures shows how to leverage consumers' interest in satiety benefits by using label claims to promote protein and satiety. 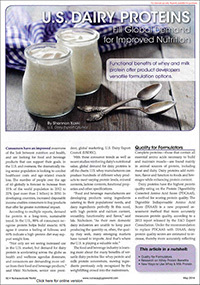 This 3-page brochure details how whey protein ingredients can make food products more satisfying and appealing to consumers. 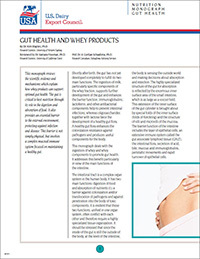 A monograph discussing whey's benefits to the main functions of the intestine and its efficacy in the treatment and prevention of disease. Available in English, Chinese and Japanese. 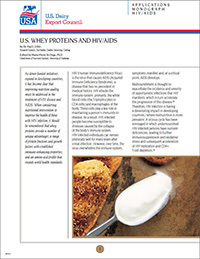 This 8-page monograph details how whey proteins provide a number of unique advantages to help improve the health of those with HIV infection. 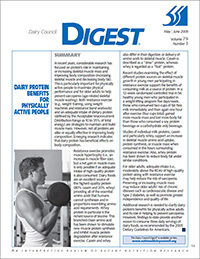 A report detailing the benefits dairy protein can provide for the physically active, including increasing body composition and skeletal muscle mass. 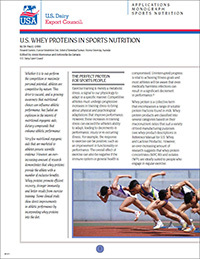 A monograph discussing the ability of whey protein to promote better recovery and immunity during exercise training. Available in English, Indonesian, Japanese, Korean, Portuguese, Spanish, and Thai. 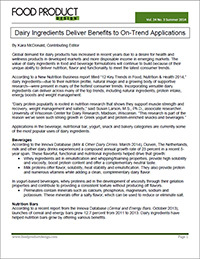 U.S. dairy ingredients add functionality, nutrition and versatility in food aid applications. 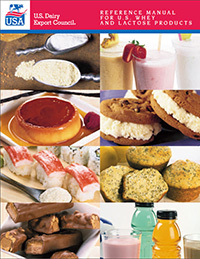 Download this brochure for more information and recipes. 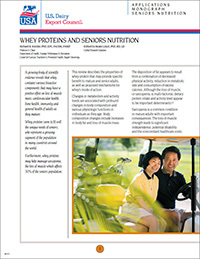 A monograph discussing the properties of whey proteins that may provide specific benefits to mature and senior adults. Available in English, Chinese, Spanish and Korean. 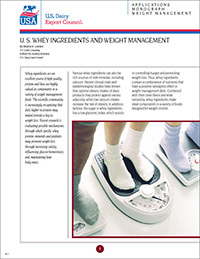 A monograph educating users of whey products in weight management applications. Available in English, Chinese, Korean and Spanish. 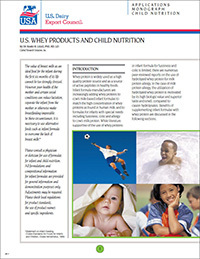 A monograph exploring the uses of whey and whey proteins in children's nutrition, including infant formula, toddler formula and more. Available in English, Chinese, Portuguese and Spanish. 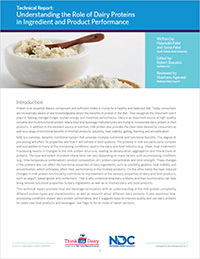 A monograph designed to educate users of whey products about the purported benefits to cardiovascular health derived from the bioactive components of whey. Available in English, Chinese, Portuguese. 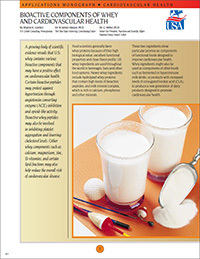 A monograph exploring new findings, applications and benefits of dairy calcium. Available in English, Chinese, Korean, Portuguese and Vietnamese. 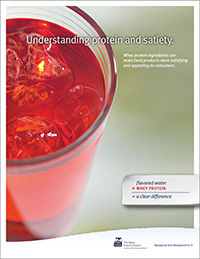 A monograph designed to educate users of whey products in nutritional and beverage applications. Available in English, Chinese, Portuguese and Vietnamese. 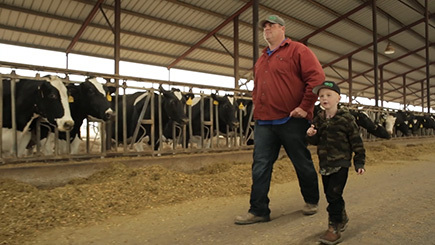 The benefits of U.S. dairy proteins for consumers of all ages and lifestyles is explained in the October 2016 Dairy Detective column. 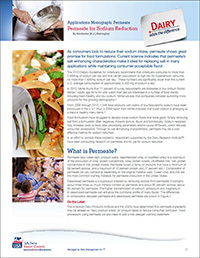 Learn about permeate, the tasteful cost effective solution to sodium reduction in foods and beverages, in the August 2016 Dairy Detective column. The March 2016 Dairy Detective column, from Dairy Foods magazine, highlights that consumers look for ingredient lists that are short and recognizable. 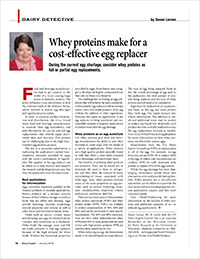 This Dairy Foods column details the benefits of using U.S. whey proteins as an egg replacement across a variety of applications. 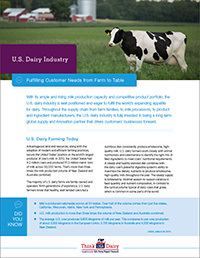 Dairy proteins can meet evolving customer needs. 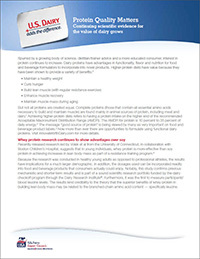 Consumers of all ages can benefit from increased and well-timed consumption of high quality dairy proteins. 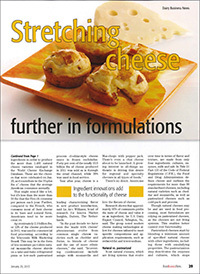 While flavor is the obvious driver for incorporating cheeses into applications, the functional benefits and nutritional advantages also contribute considerable value. 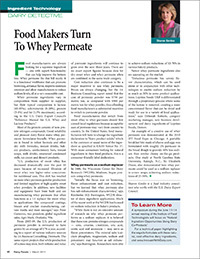 An excellent and cost-effective way to reduce sodium content in foods and beverages without sacrificing flavor is to use either whey permeate or milk permeate. 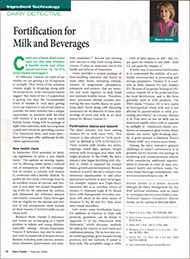 Dairy ingredients are valuable for their unique ability to deliver nutrition, flavor and functionality. 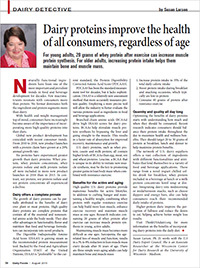 Protein has muscled its way to the package front, with many consumers seeking products containing noteworthy amounts of the macro nutrient associated with controlling blood sugar, managing weight and building muscle. 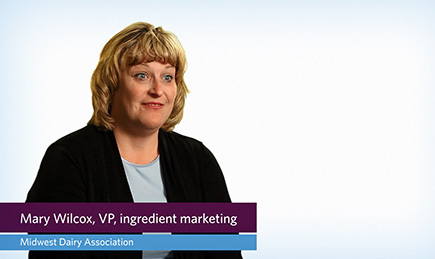 Food and beverage manufacturers are developing products using ingredients catering to their populations’ needs, and dairy ingredients perfectly fit this need. 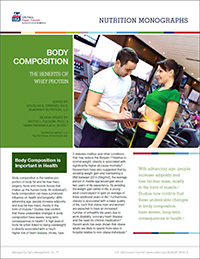 New research published shows whey protein, either as a supplement combined with resistance exercise or as part of a weight-loss or weight-maintenance diet, may provide men and women benefits related to body composition. 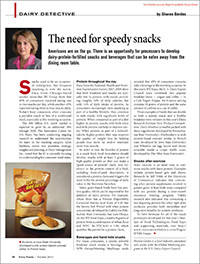 There is an opportunity for processors to develop dairy-protein-fortified snacks and beverages that can be eaten away from the dining room table. 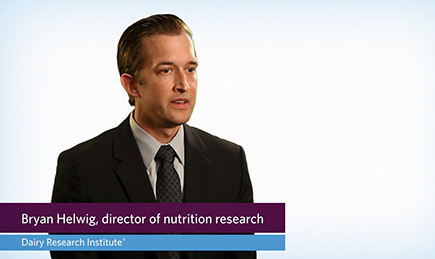 Protein is under-represented in the American diet, yet consumers want protein-rich food and beverages. 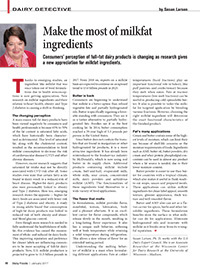 New developments from protein ingredient suppliers are driving product innovations. 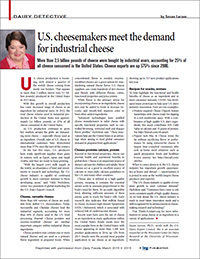 Customers in Mexico, Asia and the Middle East want U.S. cheese. But exporters have to know the nuances of each market. 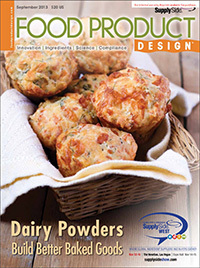 Dairy powders, dried and concentrated forms of milk and its constituents, are simple, and minimally processed. 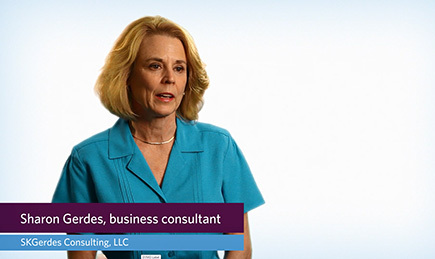 They can assist bakers with delivering better baked goods with a clean-label statement. 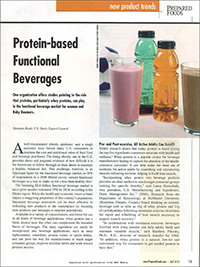 Concentrated milk or whey protein ingredients are often added to cultured dairy beverages to boost the protein level and to contribute to viscosity and mouthfeel. 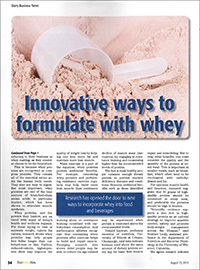 Whey proteins, and the powers they bestow, are on trend with many of today’s health and wellness regimes. Real, simple, minimally processed — these are all attributes that consumers increasingly seek in the packaged foods they purchase at the supermarket, including baked goods. 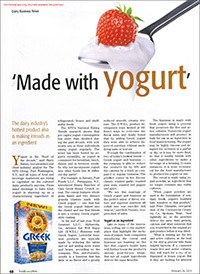 The dairy industry’s hottest product also is making inroads as an ingredient. 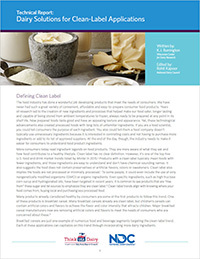 Year after year, cheese is a leading characterizing flavor in new product introduction. 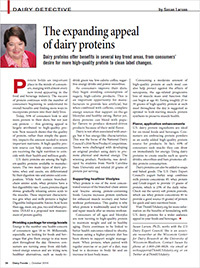 Highlights of new method proposed for measuring protein quality. 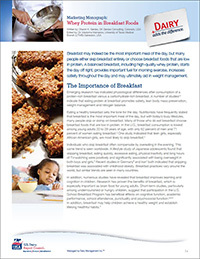 Innovating portable breakfast options with a health and wellness focus will help capture breakfast skipper sales. 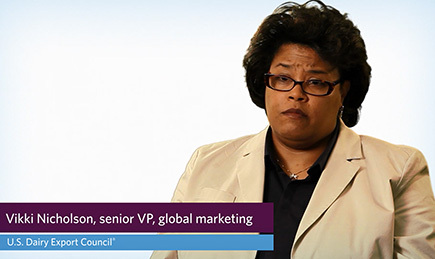 Dairy ingredients are an important tool to help make consumer-desired portable choices a reality. 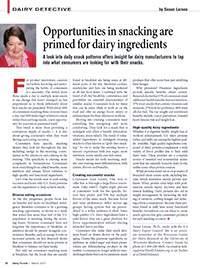 There is a global opportunity in dairy ingredients for U.S. processors. Wherever they live, the older population needs good nutrition to live well. 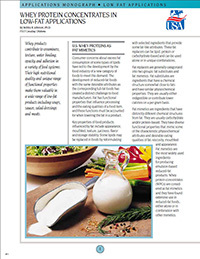 Whey powders and milk proteins can help food and beverage manufacturers develop nutritious foods. 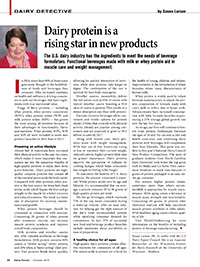 Insights into opportunities to fortify dairy-based beverages in the United States. 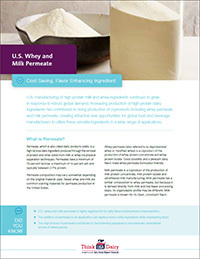 Whey permeate is increasingly recognized as a formulator-friendly dairy ingredient used in everything from instant drinks and bakery products to soups and confectionery. 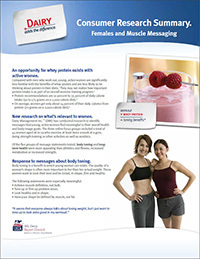 Article on marketing whey proteins in functional beverages for women and Baby Boomers. 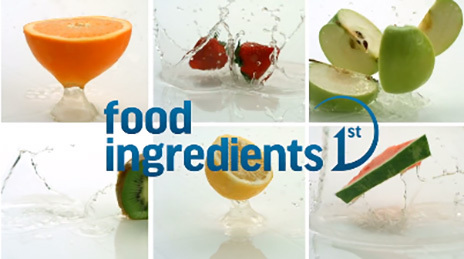 This video features innovative and inspiring U.S. dairy ingredients to tempt your taste-buds, supported by all the benefits that the U.S. dairy industry has to offer. 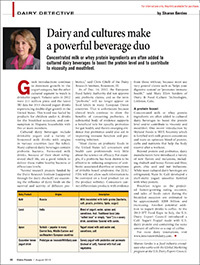 Dairy beverages are well positioned to meet a number of the emerging beverage trends. 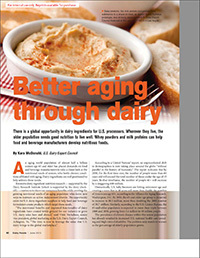 Dairy proteins are well positioned to meet the needs of an ever increasing aging population. 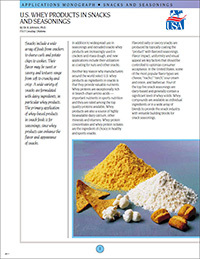 Dairy product solids (permeate) can naturally provide solutions to reducing sodium in a variety of applications. 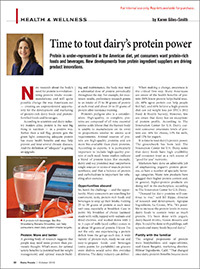 U.S. dairy proteins can help consumers achieve benefits of a higher protein diet. 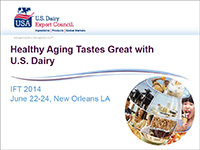 U.S. dairy proteins are high quality proteins that can be incorporated into any eating occasion. 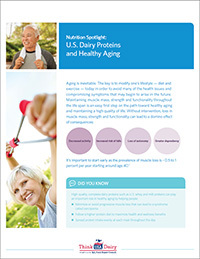 Dairy proteins, as part of a higher protein diet, can help consumers maintain a healthy weight, curb hunger, get lean, enhance exercise recovery and maintain muscle with aging.